The University of Miami’s Creative Writing Program located in the English Department offers an intensive two year study with a third year option in the reading, writing and teaching of creative writing. 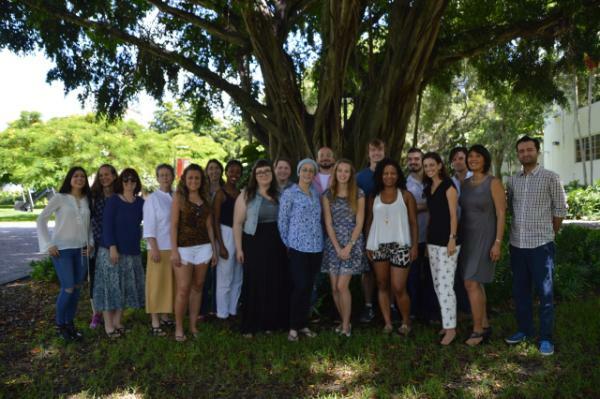 Located in Miami, an international city of polyglot communities, the program offers students the opportunity to express themselves in writing, to read widely, and to work with faculty who offer critical support. As the nation's only MFA with a broad multilingual focus, faculty at UM are supportive of the linguistic and cultural differences that students bring to their writing. In addition to languages other than English, the multilingual model allows students to write from multiple linguistic modalities such as regional dialects, slang, and technical jargon, etc. Students are encouraged to dip deeper into the linguistic well of their unique culture, history and interests to produce innovative and meaningful work. Regardless of whether students write exclusively in English, or braid more than one language into their work, the University of Miami MFA program is committed to mentoring all of its students towards the publication of their work and a life in writing. The James Michener Fellowships and Teaching Assistantships support all our graduate students. Awards include a full tuition waiver and annual stipend of $15,965. MFA candidates teach one section of Introduction to Creative Writing per semester during their second year in the program or one section each of Creative Writing and Composition. Students who choose the third-year option teach two sections of Composition per semester while receiving faculty mentorship towards professional development. Graduates of the MFA in Creative Writing have gone on to publish award winning novels, books of poetry, and creative nonfiction; have been awarded Stegner Fellowships and other residencies; and have gone on to find employment in teaching and publishing. The MFA in Creative Writing is a terminal degree. Candidates for the MFA degree must complete between 36-42 credits. 18 of these are taken in the area of writing specialization. These include workshop courses (12 credits) and thesis (6 credits). The remaining credits are taken in forms/craft classes (12 credits), electives (6 credits), and, for those with a teaching assistantship, a creative writing teaching practicum and the option of taking a second teaching practicum in preparation for teaching composition. Among the variety of electives, graduate students have taken courses in literature, interactive media, screenwriting, and photography. Teaching assistants have the option to take one section of workshop or forms either within their concentration or in the other during the third year. The final thesis must be a book-length manuscript in the student's field of interest. In fiction an approximate one hundred fifty pages are expected; in poetry, fifty. A portfolio is due at the end of the final semester. It consists of a critical paper, a sample of creative work, a self-assessment, and an annotated bibliography.